Deli Man chronicles the history of a cornerstone of North American diets: the deli. Deli Man shows the staple of sandwich biz as a part of a cultural legacy taken for granted. The booming fusion of flavours happening on the foodie scene lets deep fried peanut butter and jelly sandwiches retail for $20 a pop in Hipsterland, but a deli man can hardly make a living selling hearty old-fashioned sandwiches of meat, mustard, and rye. The film looks at the business and significance of running a deli today by showing the workings of a few of these remaining cultural institutions. Thousands of delis peppered the land a few decades ago, but only 250-ish remain in North America today. One of these two-fifty meat men is Ziggy Gruber, the larger-than-life proprietor of the Houston delicatessen Kenny & Ziggy’s Deli. Ziggy guides the audience through his introduction to the deli world, which began at the age of eight when his grandfather deemed him old enough to earn his keep. As Ziggy explains his rise through culinary school and his education of the supposedly finer foods in Europe, his Yiddish-inflected anecdotes draw out the flavour of nostalgia that even the Cordon Bleu can’t quite get right. The film smartly cuts the deli as a distinctly American flavour. Deli Man uses Ziggy’s story and affinity for carrying on the foods of his forefathers as a touchstone for the greater story of the Jewish diaspora, as Ziggy, other deli men, academics, and customers relate their experiences of (re)connecting with Jewish roots through the food that flourished when Jews spawned the deli business in turn-of-the-century New York. “You can taste the diaspora,” Ziggy says as he digs into a yummy-looking plate that drips with tradition. The different talking heads reveal how various pockets of Jewish culture are responsible for adding different spices or pepperings to the deli meats and how they have created a larger cultural flavour thanks to the varying culinary traditions of Jews from different European backgrounds. The film shows the deli as part of the American melting pot as flavours blend with a distinctly American (even New Yorker) attitude and sense of humour. Deli Man uses the past and present stories to show how people connect over simple and familiar foods by finding pleasure in the taste of a home cooked meal. 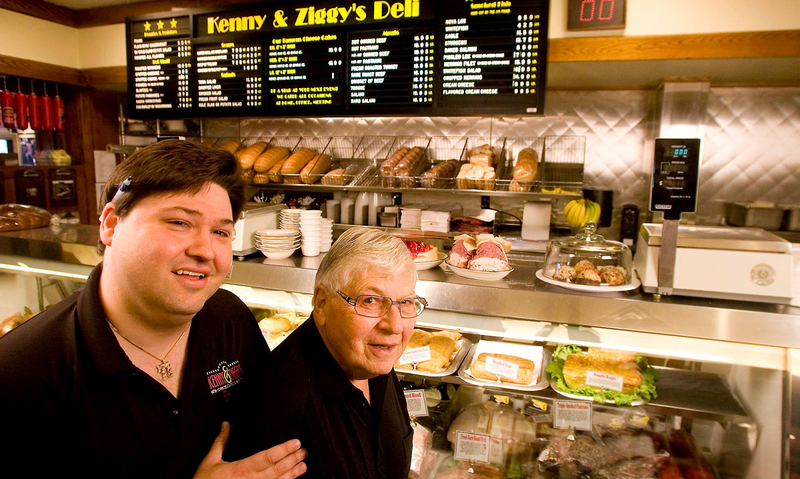 As Anjou talks with Ziggy and a host of other delicatessen owners, including Zane Caplansky of Toronto’s Caplansky’s Deli, and a host of celebrity deli patrons, including Jerry Stiller, Larry King, and Fyvush Finkel, the film playfully explains the ongoing pleasure in the deli’s tasty sandwiches and atmosphere. The film shows a unique flavour that doesn’t quite exist in any other kind of greasy spoon in North America, as the sense of community created by familiar flavours is the deli’s secret ingredient. The story of the past works in tune with the present-day pleasures found in deli food, too, as Ziggy’s story of the deli is ultimately one of cultural preservation in the face of assimilation. The film shows how the deli confirms a piece of Jewish culture bite by bite by sharing it with friends, family, and strangers. The colourful cast of Deli Man are also a great party to share company with in this amiable doc. There are mensches galore to be had as the deli men and their peers share laughs and anecdotes with stories laced with words and idioms for their grandparents days. The film offers a decidedly Jewish sense of humour (a lot like one sees in Alan Zweig’s When Jews Were Funny) as the different talking heads all bring an edge of self-deprecating humour to the table. To laugh is to endure, and Deli Man shows that a belly that laughs often is always hungry for more. Anjou whips together a fun doc with a deli man’s recipe. The film is as traditional as good pastrami on rye itself, with meat (interviews), bread (archival footage), mustard (humour/spice), and an unexpected sense of relevancy as the pickle that tops it off. The enjoyable Deli Man, though, finds its best course in the food. The film plays like a special episode of Diners, Drive-Ins, and Dives (in a good way) as the camera creeps into the kitchens of the delis and reveals the different practices and recipes that give each deli its distinctive flavour. Piles of pastrami stacked high, mouth-watering veal chops, steaming bowls of matzo ball soup, and smoked delights are all bound to makes audiences rumble and run for the nearest grub. Deli Man leaves you satisfied and hungry for another bite. Deli Man opens in Toronto at The Bloor Cinema on June 19.